Whether you’re a local in need of a stay-cation or a visitor coming to enjoy our sugar-white sands, everyone can use a vacation! If a late summer stay is on your mind, now is the time to start planning. We love a late summer getaway for a few reasons: the traffic is lighter, the weather is still warm, and rates are better than in-season. Experience the bliss of a late summer getaway yourself with our lodging partner Southern Vacation Rentals; from homes designed for multiple families to cool condos, they have something for everyone. 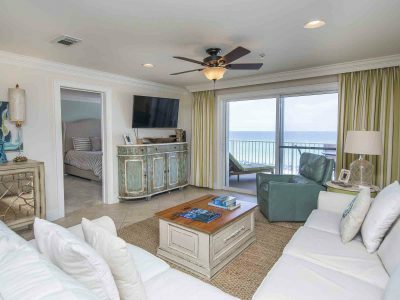 We’ve highlighted three of our favorite Destin vacation condos below, all available for an August 4th arrival! Crystal Dunes 304: With three bedrooms, two bathrooms, and space for eight, Crystal Dunes 304 is sure to please! The condo’s coastal-chic decor will always remind you that you’re at the beach. Plus, from the second you step in you’re greeted by beautiful views of the sparkling Gulf. Thoughtful amenities include flat-screen TVs in the living room, master bedroom, and second bedroom. The kitchen features granite countertops and stainless steel appliances, so you’ll be cooking in style! Be sure to relax with Crystal Dunes’ fabulous amenities, including a Gulf-front pool, hot tub, and direct beach access. Tops’l Beach and Racquet Resort – Summit 311: For the ultimate relaxing getaway, stay at the Tops’l Resort in Destin. Ranked as one of the nation’s top tennis resorts, the complex features no shortage of fun. When you stay at Summit 311, you’ll be whisked away to your own rejuvenating beach retreat. The condo features two bedrooms and accommodations for eight, making it perfect for group travel. Everyone will love the cozy bedding, private balcony, and beach access. Plus, Tops’l also features a fitness facility, indoor and outdoor pool, and on-site dining. Breakers East 304: Looking for a condo located right on the water? It doesn’t get any better than Breakers East 304. 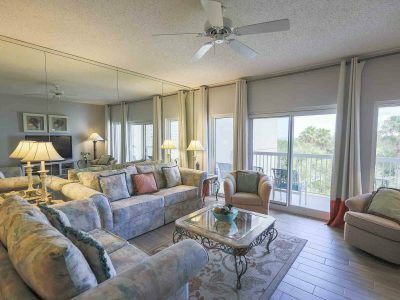 Situated three stories high above the Gulf of Mexico, this two bedroom Destin vacation condo also sleeps eight guests. We love it for its subtle touches of luxury – a wide balcony, granite countertops throughout, and state of the art stainless steel appliances. 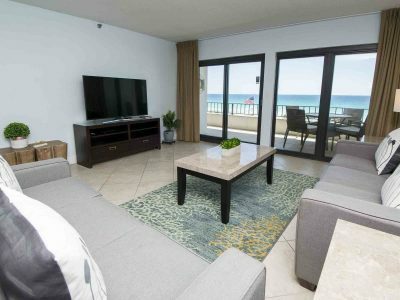 Gulf views can be found via balcony access off the master bedroom and living room. Feel refreshed when you relax at Breakers East; be sure to take advantage of the outdoor pool, tennis courts, and direct beach access. When you’re ready to reserve your vacation condo in Destin, give Southern Vacation Rentals a call! We’ll see you at the beach!